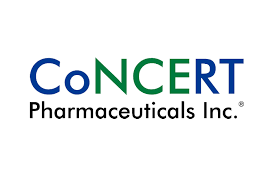 Concert Pharmaceuticals, Inc. today announced that interim clinical data from its CTP-543 Phase 2 trial in alopecia areata has been selected for an oral presentation at the Late-Breaking Research Program during the American Academy of Dermatology (AAD) Annual Meeting being held March 1 – 5, 2019 in Washington, D.C.
fi® in the United States for the treatment of certain blood disorders. Deuterium modification of ruxolitinib was found to alter its human pharmacokinetics in ways which may enhance its use as a treatment for alopecia areata. The U.S. Food and Drug Administration (FDA) has granted Fast Track designation for CTP-543. Alopecia areata is an autoimmune disease that results in partial or complete loss of hair on the scalp and body that may affect up to 650,000 Americans at any given time1. The scalp is the most commonly affected area, but any hair-bearing site can be affected alone or together with the scalp. Onset of the disease can occur throughout life with the majority of patients initially having symptoms by age 40. It is believed to equally affect both women and men. Alopecia areata can be associated with serious psychological consequences, including anxiety and depression. There are currently no drugs approved by the FDA for the treatment of alopecia areata. Following the FDA’s Patient-Focused Drug Development meeting held in September 2017 on alopecia areata, the FDA summarized the input shared by patients and patient representatives in a Voice of the Patient report. Concert Pharmaceuticals is a clinical stage biopharmaceutical company focused on applying its DCE Platform® (deuterated chemical entity platform) to create novel medicines designed to treat serious diseases and address unmet patient needs. The Company’s approach starts with previously studied compounds, including approved drugs, in which deuterium substitution has the potential to enhance clinical safety, tolerability or efficacy. Concert’s pipeline of innovative medicines targets autoimmune diseases and central nervous systems (CNS) disorders.